So many great movies have come from Hong Kong and China over the years it's tough to know where to start... 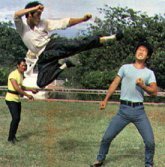 So we'll start with this quiz on heaps of the cool action / kungfu gems which Hollywood will never cease to try to imitate. 1) What was the the stolen sword made out of, in the epic "Crouching Tiger, Hidden Dragon"? 6) What happens to the bad guy at the end of Jet Li's "Meltdown" as he lays dying from poison on the street? 2) Where was evil gang lord Johnny's huge cache of weapons hidden in the John Woo classic "Hard Boiled"? 7) What happens to one of the native porters after he gets mauled by a tiger, in the giant-monster laff-riot "Mighty Peking Man"? 8) Where does the spinny girl who works at the food stand decide to go on the day she was supposed to have her first date with cop Tony Leung, in "Chungking Express"? 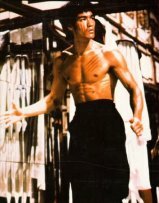 4) In which Jackie Chan movie does Jackie's character die? 9) Where didthe evidence against the mafia and CIA turn out to be hidden, in the 2000 action flick "Tokyo Raiders"? 5) What kind of beer does the hitman have his fridge stocked with (then later we see the empties), in Wong Kar-Wai's "Fallen Angels"? 10) How many "Once Upon a Time in China" movies did Jet Li star in? 11 - 14) Match up Bruce! 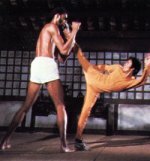 Match the pic to the Bruce Lee flick. There is an extra flick or two in the list, so be on your guard!